This weekend Little Miss I came to me and said she had a recipe of her own, and she wanted to make it for me (and publish it in this blog, of course). When I asked what her dish was called, I heard “Swedish pancakes.” However, when I inquired about what made them Swedish, she said: “No, mom… Sweetish pancakes. And they have a heart made with mushed strawberries, and then blueberries and a cherry on top. All you need to do is make your pancakes and I’ll take care of the rest.” She said she’d find a story to go with them, but then she dropped the idea and told me to find one myself. I came across Eric Carl’s “Pancakes, pancakes!”, which I’ll be reviewing after the recipe. So, here’s the recipe for Blueberry buttermilk pancakes and how to transform them into Sweetish Pancakes, Issa’s style. Buttermilk blueberry pancakes with a topping twist to satisfy little people. Mix the flour, cornmeal, baking powder, baking soda, sugar and salt in a medium bowl. Whisk together the buttermilk, melted butter, lemon rind and egg yolks until well incorporated. Pour the wet ingredients over the dry ingredients and mix until the dry ingredients are evenly moist. With an electric mixer, beat the egg whites until they form soft peaks, making sure the don't become too dry. Incorporate to the flour and buttermilk mixture, enveloping carefully to keep the raise of the egg whites. Incorporate the blueberries at the end. In a pan or pancake griddle under medium heat, melt some butter and then drop 1/2 c of batter. Wait until there are some bubbles forming on the top of the pancake before you flip it, making sure it is golden brown. Cook for an extra couple of minutes and repeat, until you've used up all the batter. I made 6 large pancakes this way. If you want smaller pancakes, you can use 1/4 cup of batter per pancake. For the toppings, puree the strawberries and Greek yogurt in a blender, making sure the fruit is well incorporated making the yogurt pink. 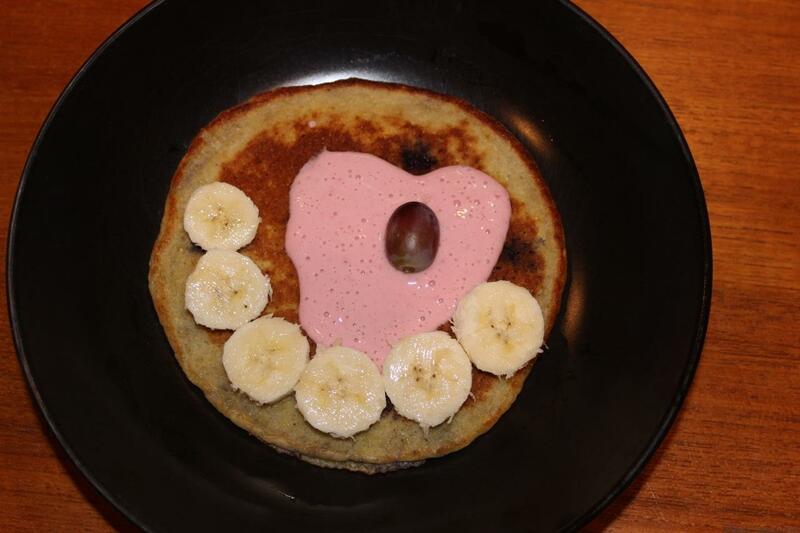 Using a spoon pour the strawberry yogurt on top of the pancake forming a heart. Then place a grape or a cherry in the middle. Cut banana rounds to decorate the bottom of the heart. I didn't have buttermilk one day, so I used 1/2 cup sour cream and 1 cup of whole milk. The pancakes turned out great and soft, but the dough was a little thinner than with buttermilk. Great substitution if you don't have buttermilk, though! Another way to substitute buttermilk is for plain yogurt -- just use the same amount of yogurt instead of the buttermilk. Now for the book. We got “Pancakes, pancakes!” by Eric Carle, the beloved author and illustrator of many children’s classics, like “The Hungry Caterpillar” and “Brown bear, brown bear,” among many others. Carle’s simplicity and child curiosity in his writing is always great, and in this case he goes into what you need to get each and every one of the ingredients for making the pancakes — first you have to mill the wheat into flour, get an egg from a hen, milk the cow, churn the butter, etc. Little Miss I’s favorite part was the very end, when Jack finally tells him mom he knows just what to do… It was fun for her and an eye opening read to go through the stages of making the pancakes and then realizing there’s so much more than just mixing things together. The recipe in the book is in essence similar to what we did, but I most definitely NOT flipped my pancakes in the air! So, get the book, have a fun weekend breakfast cooking with the kids, and enjoy Issa’s Sweetish Pancakes too! Tagged Book reviews-recipes, Cooking with Children, Inspiration for Kids. Love it, totally inspired to make “Sweetish Pancakes” tomorrow. 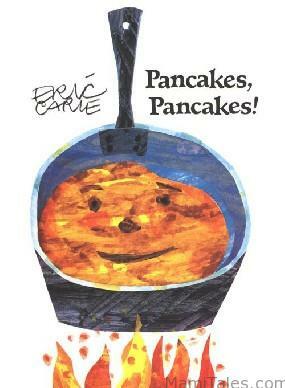 We have not read this Eric Carle, book, better rectify that as the toddler does love pancakes. Thanks so much for joining us on the Kid Lit Blog Hop and for inspiring yet another indulgent breakfast, he he. That’s so cute! I’m going to have to show these Sweetish Pancakes to my kids. This is definitely an inspiration. I have to admit, I haven;t read this Eric Carle book.. and we have read very many of his when daughter was little/ Thanks for sharing the review and recipe. I am definitely trying this out at home!